Graduated of the University of Chieti, Italy. Maintains a Private Practice in Pescara, Italy since 1988. Dedicated his career to the research in the field of tissue reaction to endosseous biomaterials and bone regeneration. Founded the “Biomaterials Clinical and histologic Research Association”. (Bio.C.R.A.). Scientific director of the “Biomaterials Clinical and histologic Research Association”. Visiting Professor at the Dental School,University of Chieti-Pescara, Italy. Formerly: Assistant Professor at the Dental School of the University of Ancona -Italy. Assistant Professor at the Dental School of the University of Naples Federico II -Italy. Formerly: Member of the Board of Directors of the “Sename”. Implantology Association. 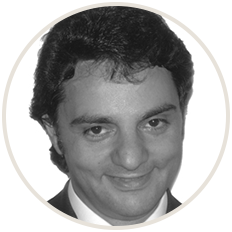 Co-founder and Vice-president of the SISBO (Italian Association for the study of bisfosfonates in dentistry). Diplomate of the International Congress of Oral Implantologists. Author and coauthor of several papers published in National and International journals. Invited Speaker in National and International Congress. The lecture will describe the rationale and the scientific basis for the development of the concept of the Osseodensification and the studies which allowed to develop this concept. The second part will address the clinical application of the Osseodesification processes in various indications where the technique allow to manage an easy solution. The objective is to show the possibilities and limits in the clinical use of the Osseondensification technique and the scientific basis for the correct clinical application of the Osseodensification protocols.